Saturday 07 November 2015. Park Run: Marlay Park. Saturday 07 November 2015. Park Run: Marlay Park. Father and daughter Maeve (12) and Aidan (51) Conroy. 085 167 3773. 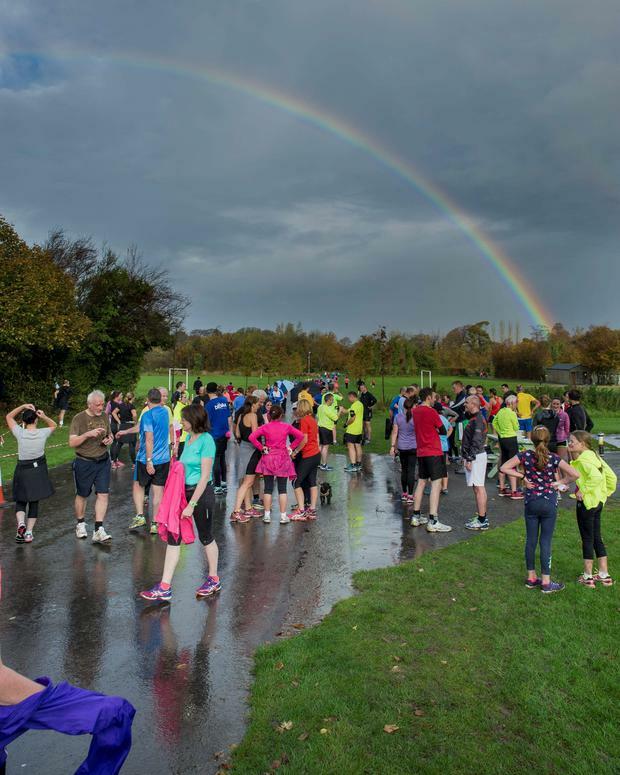 Heavy rain did not deter more than 350 runners entering the weekly Park Run at Marlay Park in Dublin on Saturday morning. Weekly 5km Park Runs are held throughout the world each Saturday at 9.30am as part of a growing fun run phenomenon. Among the parks in the Dublin region hosting Park Runs are Tymon, Cabinteely, Waterstown, Shanganagh, St Anne's, Porterstown, Poppintree, Griffeen, Father Collins and Hartstown. Runners register once on parkrun.ie and all ages participate. There are no medals and most runners use barcodes to check their running times to beat their personal best times. Among the runners at Marlay Park in Rathfarnham were a group of schoolgirls from Alexandra College who took part with their PE teacher Aileen Wootton. "The girls ran on Saturday to raise money for The Hope Foundation which helps children in Calcutta," said Ms Wootton (51), who regularly volunteers at Park Run events. "The fifth year girls will travel to Calcutta at Easter," she said. "The park runs have a growing appeal for runners aged from 15 to over 70. "They take place all year round and are great for physical and mental well-being as well as being enormously sociable and enjoyable," she said. Fastest times in Marlay Park at the weekend were: Male - Kevin Keane (17.43); and Female - Aisling O'Connor (21.10).